I've had some requests to write a Vault extension that talks to Bluestreak. There is only one problem, I have no idea how the thing would work. Sure, I could talk with some of the Vault product designers and the Bluestreak team to get more information. But I'm going to try something experimental. I'm going to let you, my readers, design the thing. If you have an idea, sent it to doug.redmond AT autodesk.com. Feel free to include things like features, workflows and even rough UI sketches. My time is limited. Just like with all my other sample apps, this is a side project. So don't get too complex in your feature requests. I reserve the right to not implement your request for any reason. Try not to take it personal. I'm going to start coding soon, and I code fast, so don't wait to make your suggestions. Update: Q-Tools 2013 is now available. Note: Click here for Q-Tools 1.0. Here is Q-Tools 2.0. I updated it for Vault 2012 and hopefully fixed the multi-site issues. I also added, by request, the ability to email multiple addresses when errors are detected. Although the web service events feature was designed to hook to all Vault clients on a computer, it doesn't meant that it is required to hook to them all. Sometimes you want to hook to an event for just one application, and that's fine too. I'll refer to the scope of the event as the set of applications that you are interested in receiving events from. Create a class that implements the IWebServiceExtension interface. Subscribe to events in the OnLoad() function. Write your event handler logic. Set your <extensionType> to WebService in the .vcet.config file. Deploy to the ProgramData folder. Open up the DLL project for your Vault Extension. Do not implement the IWebServiceExtension interface. Subscribe to events in the OnStartup() function for your IExplorer implmentation. Your <extensionType> is still VaultClient in the .vcet.config file. No changes or additions are needed. Deployment is still to the ProgramData folder. Again, no changes. Open up the project for your CAD plug-in. During startup, subscribe to the web service events from the Vault API. This assumes that the CAD API framework lets your code run during startup. Deploy according to the rules of the CAD framework. This technique will allow you to hook to all the Vault web service events for that CAD application, even if another plug-in fired them. 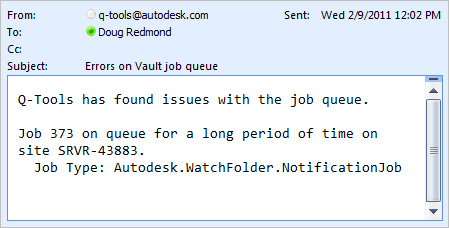 For example, you can write your own AutoCAD plug-in which responds to events from the default Vault plug-in. If you want to scope your event to an application, but you can't write a plug-in, there is still an option. All you need to do is follow scenario 1. In step 4, when you are writing your event handler logic, check the name of the running process. If it's not an application you want events from, exit the function. There is no perfect way I know of to get the name of the current process. The safest ways is probably to can use the first value from System.Environment.GetCommandLineArgs() to find the application name. You can also use System.Diagnostics.Process.GetCurrentProcess().ProcessName, but it might throw security exceptions depending on the user permissions. System.Windows.Forms.Application.ExecutablePath is also unreliable because it only works for Windowed applications. The nice thing about this technique is that you can allow multiple applications. Or you could use it to exclude specific applications. For example, you exit the event handler if the application name is "JobProcessor.exe". We now have a discussion group specifically for Vault customization topics. I expect that it will be mainly used for API questions, which is fine. But also feel free to post feedback, tips and tricks, sample code, utilities, and anything else related to customization. I've added some things designed to highlight articles that, in my opinion, every Vault developer should know. There is the Must Read category, which lets you view all the important articles. There is also a Must Read summary page, which has a quick list of all the articles. Some people have noticed that there is a new job queue column called Priority. This is an API feature, at least for now. So you have to use custom programming if you want to make use of this value. From Vault Explorer, you can see the value, but you can't do anything with it. You have 3 tasks (A, B and C) which you want to complete in order. So you queue up all three jobs at once, giving A a priority of 1, B a priority of 2 and C a priority of 3. Now you are guaranteed that they will get executed in order, right? Because there may be multiple Job Processors running and because Job Processors can be specialized by type, you are not guaranteed the order. It's technically possible for C to get executed first, with B second and A last. Or any other permutation. You are doing a batch operation using the job queue. This operation will take several days, involving thousands on jobs on the queue. In the meantime, the vault is still in use by end users. You want don't want the batch operations to interfere with user-driven operations. So you queue the batch jobs with a low priority while user jobs get a high priority. The priority feature lets you move jobs to the front of the line if needed. Likewise, you can indicate jobs that should run in the background. The way it works is pretty basic. The priority value is an integer. The lower the number, the higher priority, with 1 being the highest possible priority. When the Job Processor reserves a job, it will reserve the job with the lowest priority for a type that the Job Processor supports. If there are 2 jobs with the same priority on the queue, then the first one added is the first one processed. Jobs with types that are not supported by a Job Processors are basically invisible to that process. So the priority is based on only visible jobs. For example, the Job queue consists of job A (priority 1) and job B (priority 7). The Job Processor supports only type B. The result is that job B is read off the queue next. Job A will not get processed by this Job Processor since it is a unsupported type. When deciding what priority your custom jobs should have, it helps to have some context. Vault Explorer and the CAD plug-ins use 10 as the default priority value for jobs. Autoloader uses priority 100 when it queues jobs. Jobs triggered automatically via a lifecycle state change are also queued as priority 100. Once a job is on the queue, it's priority cannot be changed. The workaround is to remove it from the queue and re-add it with a different priority. This can easily be done through the API, but there is currently no UI command to do this task. Normally I don't comment on press releases or demo videos, but the SharePoint integration is different. I was personally involved in this project, so I'd like to share some of the technical details. This integration was a joint effort between Autodesk and Microsoft. Overall, I loved working with the Microsoft team. After all, my last name is Redmond. They helped develop some of the features and were great at getting me up to speed on SharePoint development. The Vault integration is built on a SharePoint API piece called Business Connectivity Services (BCS). The quick definition is that BCS makes data from an outside system look like SharePoint data so that the SharePoint framework can work with it. In this case, Vault is the outside system. The Vault integration contains no web parts. Everything is done through BCS and standard SharePoint components. This means that the Vault data can hook into existing SharePoint features. As shown in the videos, this feature hooks into the list and workflow features. The end users may not even realize that they are working with Vault data. Autodesk Vault for SharePoint 2010 comes with some basic functionality out of the box. But the real power will probably come from customizations. SharePoint has a dizzying amount of customization features from simple to complex. By using BCS technology, Vault data can hook into many types of customizations, from basic lists to complex web parts. I personally can't wait to see the type of things people do with the Vault integration. I'll probably create some sample apps of my own just for fun. So check back often.